It’s that time of year! 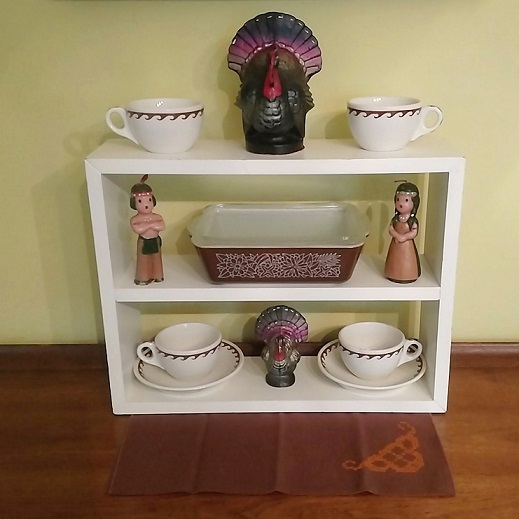 I’m doing little house projects and decorating like mad for a holiday project! 🙂 Shipping out and making orders and keeping up with regular life activities have me busy busy! The vintage holiday section has about 100 pieces in it as usual, coming and going with a furry! So grab quick there! SALES-let’s get to it! I’m having sales all weekend through Tues in both my artgoodies etsy shop and also my vintage shop where you can SAVE up to 30% OFF! And here on my regular website there are Cyber Monday SALES starting today and going through the 30th! SHIPPING! I’m shipping every single day! If you buy directly from me, which I hope you will, the best way to support an independent designer/maker/curator of vintage things, is to buy straight from the source! SO, get your orders in asap, and keep in mind the following USPS domestic shipping dates, most of my packages will ship through the post office. First class cut off date-Dec 19th, Priority-20th, Express-22nd. Every year I’m scrambling to help some poor soul overnight a package. I’m happy to do all I can but really, by that point I’m tired, bleery eyed, probably have to walk 2 miles in the snow to get the package there, you get the idea, please please please, don’t do it, hahahahaa. That said, as usual I’m always happy to send packages directly to the recipient, wrapped in tissue and tied with a bow I can save you time and shipping money by sending direct! 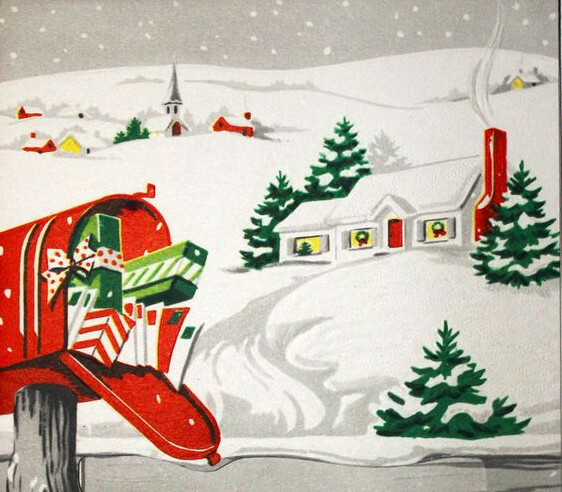 Happy Holidays all! Color of the Month November 2017! November! I’m feeling more chipper about the holiday season this year. Maybe it’s because we’re slated for a fun photo shoot, or because the temps have been awesome and I’ve been gardening away for what seems longer than normal. I did a big pre cold harvest in the garden to avoid the usual and sometimes flashlight assisted panic harvest. So much better, ha. We’ve also been busy gathering up all sorts of goodies for the vintage shop! Vintage holiday as well as the usual home goods. Plenty of vintage to choose from this season! Plus I’ve been working more in the studio: making, cleaning, and thinking of new plans and ideas which feels nice. I’ve really been on a bit of a hiatus, focusing on Stephan and I, the wedding, not feeling well before and after surgery, and just feeling tired from working SO hard for sooo long. I’m gearing back up though, so look out. Let’s get back to the Color of the Month, getting festive for Thanksgiving, and I’m already thinking holiday decor! 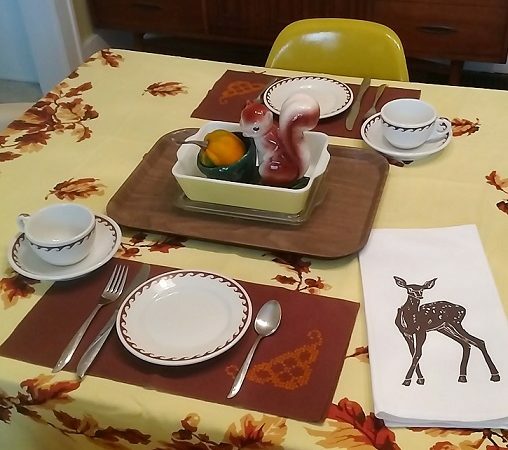 Fave vintage: Gurley candles, Warwick China, Pyrex, anchored by an embroidered napkin. 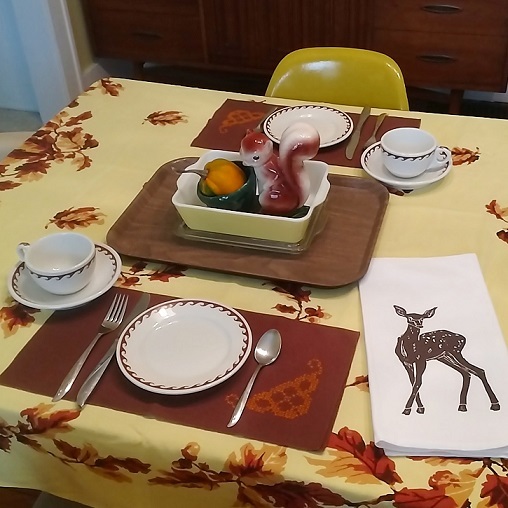 Fave vintage: another great fall tablecloth, napkins doubling as placemats, pyrex, squirrel planter, Warwick restaurant Ware dishes, and and artgoodies deer towel to finish it off.